Smart Storage is clever multi-purpose and space-saving solutions that take learning environments to the next level. Classrooms of the 21st century are open, flexible and dynamic. Classroom storage should not only support such an environment but enhance it too. Every classroom needs storage for writing equipment, craft supplies and educational resources. Why not make it Smart Storage? Explore our Teacher Stations and get inspiration for how to organise and store teaching resources. Our shelving, storage drawers, bookcases, tote units and cupboards are equipped with lockable castors so you can quickly move the units around the room then lock in place. 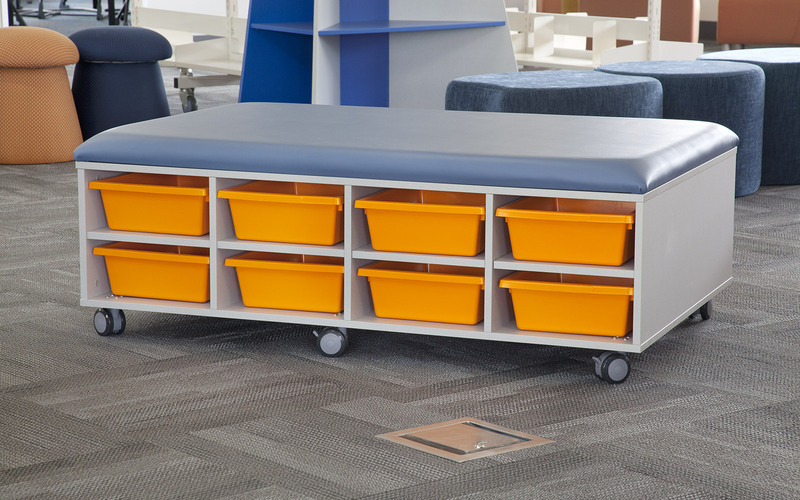 Our Mobile ottomans with built-in tote compartments are two in one storage solutions and seating solutions that will transform the way you organise, use and arrange your classroom. Double-sided bookcases allow for more book storage and access from both sides. Shelving and bookcases are essential go-to furniture pieces that make it easy to store books, educational resources, craft supplies and folders. Classroom storage cabinets like mobile swing door cupboards or built-in overhead cupboards allow you to store bulkier supplies out of sight. Classroom poster storage or even art storage is no hassle with our mobile art trolleys. The dividers keep all artwork and posters neat and orderly. There is so much Smart Storage can do in your classroom! If you buy in bulk you will find out BFX Furniture can be relatively inexpensive classroom storage solutions. Shop our full range of shelving, bookcases, tote units and cupboards and discover how Smart Storage can transform your classroom today. How Do You Know You’re Getting the Best Smart Storage? The only way to know for sure that you’re getting high-quality school furniture is to ensure it has been tested and certified to Australian Standards. BFX holds the largest amount of independently tested products by AFRDI.